Take on a sponsored challenge! Taking on a personal challenge is a great way to help Tibetans. You can run, cycle, swim, skydive, trek… whatever your passion, there’s an event out there to suit you. We’ll support you every step of the way with your fundraising and training, and if we can we’ll be there in person to cheer you on! 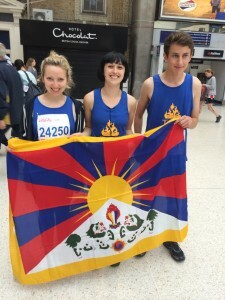 You’ll also get an exclusive Tibet Relief Fund running vest or t-shirt, and a certificate of thanks after the event. The money you raise will make a real difference for Tibetans. You could support an elderly refugee with food and warm clothes or help a new mother give birth safely. Every pound you raise helps us continue our vital work – thank you. We have four places for 2019 in the iconic Prudential RideLondon-Surrey 100 cycle! Apply here by 29 March to be on our team. The race takes place on Sunday 4 August 2019. Otherwise, it’s completely up to you! Most challenge operators let you raise money for your chosen charity, and all you need to do is buy your own place and raise as much as you can for Tibet Relief Fund. For popular events like the London Marathon you’ll need to enter a public ballot to win your own place – make sure you are aware of key dates and deadlines so you don’t miss out. If you already have a place, please consider fundraising for us! Once you’ve decided on your challenge, let us know by calling 020 3119 0041 or emailing [email protected] . We can’t wait to support you in your challenge and help you achieve your goals!